Correct sizing of corrals or paddocks plays an important role in conserving your pastureland. Horses can overgraze a pasture, which can take years to recover. And when the ground is wet, horse hooves can quickly tear up the grass and leave only mud. Putting your horses in a paddock periodically can protect the pasture grass and help prevent overgrazing, but the paddock must be big enough for the horses to get a little exercise. The size of your paddock depends mostly on the amount of space you have available. If you're short on space, a corral 16 feet square is large enough for most horses for a few days at a time. This is 256 square feet. Ideally, each horse would have more space though -- about 600 square feet to call his own. Multiply that by the number of horses; if you're keeping two horses in the paddock, the ideal size is 1,200 square feet. Horses are active animals, enjoying a good run or some playful kicking. Instead of making your paddock a square or circle, designing it as a rectangle gives the horse room to gather speed as he runs so he can work off some of his energy. In smaller corrals without long straightaways, he can only eek out short bursts of speed combined with sudden stops, or a slower lope around a circle enclosure. If your land layout allows for a rectangular pen, it can be much narrower than it is long. Still, it should always be at least 14 feet wide. A width of 20 to 30 feet is preferable. For example, a corral 20 feet wide by 60 feet long gives you 1,200 square feet, and it provides more room for straightaway running than one that's 30 feet wide by 40 feet long. The slope of the land is an important consideration when you're planning the size and shape of your paddock. The ground should have a 5 percent grade or less. A slight slope allows the paddock to drain properly; you don't want your horses standing in water or mud, but constantly standing on uneven ground is uncomfortable. Adding several inches of sand or pea gravel can help with drainage and keep the horses' hooves out of the mud. 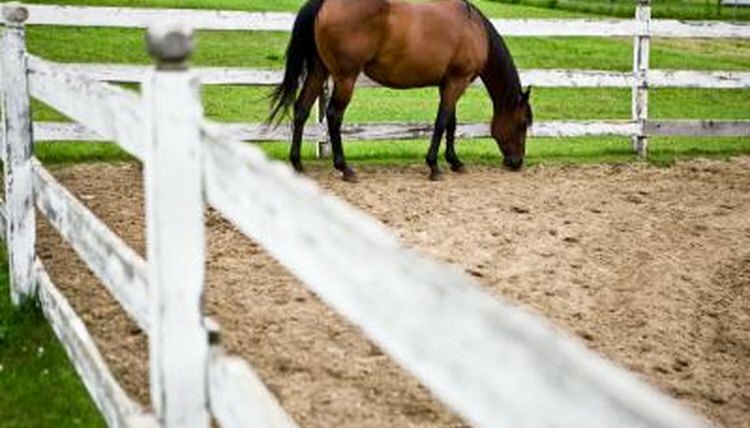 The Horse: How to Size Your Horse's Paddock?